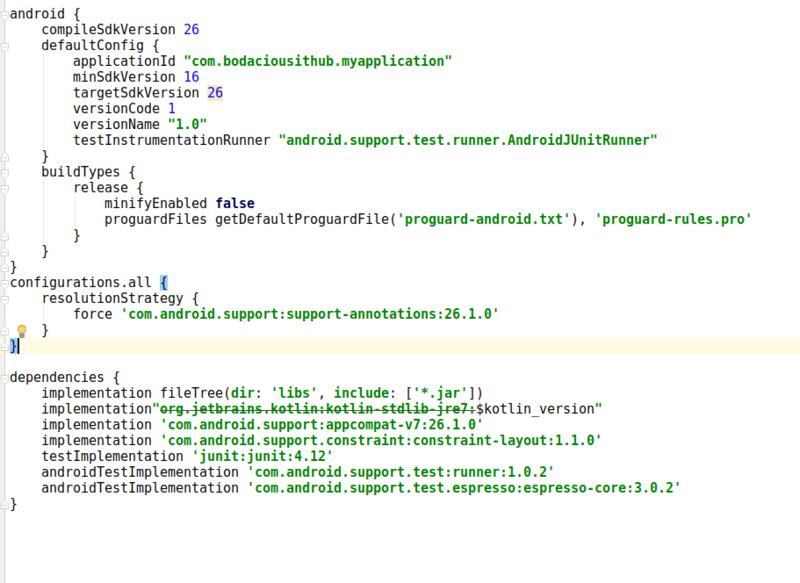 Conflict with dependency 'com.android.support:support-annotations' in project ':app'. Resolved versions for app (26.1.0) and test app (27.1.1) differ. I am new to Android App Development. 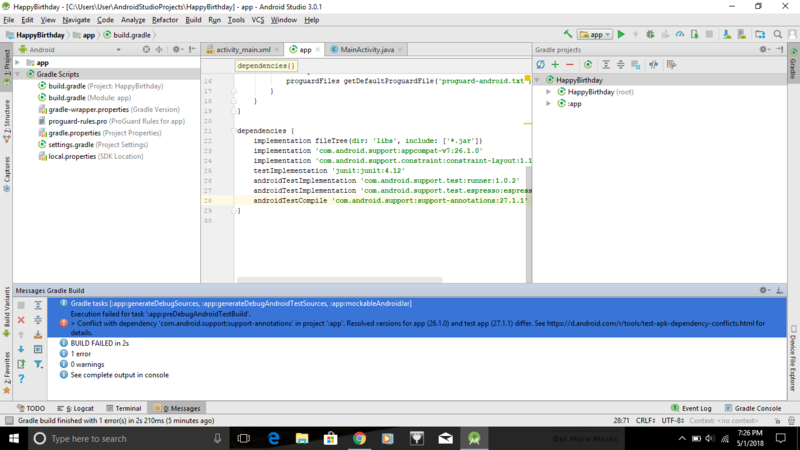 When I tried to create a new project,Android Project...the following message popped up..
Error:Execution failed for task ':app:preDebugAndroidTestBuild'. i also tried adding this code to my dependency.. androidTestCompile 'com.android.support:support-annotations:23.3.0' this didn't work out. I also tried 27.1.1 and 26.1.0.. that didn't work out either. // modules in the project. // The following are only a few examples of the types of properties you can define. // versions between modules can avoid behavior conflicts. Add the below line in your app.gradle file before depencencies block. There's also screenshot below for a better understanding. the configurations.all block will only be helpful if you want your target sdk to be 26. If you can change it to 27 the error will be gone without adding the configuration block in app.gradle file. There is one more way if you would remove all the test implementation from app.gradle file it would resolve the error and in this also you dont need to add the configuration block nor you need to change the targetsdk version. This is very similar to the @emadabel solution, which is a good alternative for doing it, but without the block, or the rootproject prefix. Go to the "Project" Directory structure and in that go to "Gradle Scripts" and inside it go to "build.gradle (Module:app)" and double click it. REBUILD THE APP AND IT WORKS !! and hopefully, you will solve your bug. The solution is to make your versions same as in all modules. So that you don't have conflicts. I felt when I have updated versions of everything- gradle, sdks, libraries etc. then I face less errors. 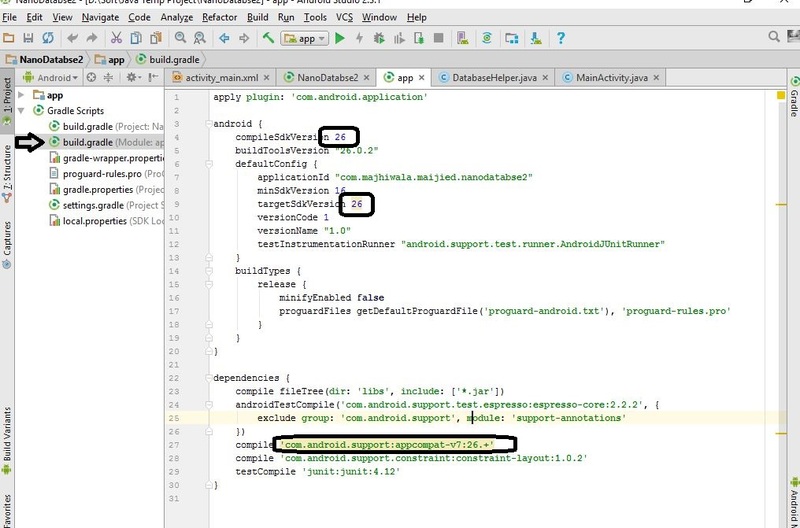 Because developers are working hard to make it easy development on Android Studio. Always have latest but stable versions Unstable versions are alpha, beta and rc, ignore them in developing. I have updated all below in my projects, and I don't face these errors anymore. Add this to your gradle file. If changing target sdk version doesn't help then if you have any dependency with version 3.0.2 then change it to 3.0.1. A better solution is explained in the official explanation. I left the answer I have given before under the horizontal line. Use an external tag and write down the following code below in the top-level build.gradle file. You're going to change the version to a variable rather than a static version number. Change the static version numbers in your app-level build.gradle file, the one has (Module: app) near. Sync your project and you'll get no errors. You don't need to add anything to Gradle scripts. Install the necessary SDKs and the problem will be solved. What's the difference between implementation and compile in Gradle? How to resolve conflict with dependencies for com.android.support? “Resolved versions for app (26.1.0) and test app (27.1.1) differ”?